Malaysia Airlines Flight 370 (MH370/MAS370), also marketed as China Southern AirlinesFlight 748 (CZ748/CSN748) through a codeshare, was a scheduled passenger flight fromKuala Lumpur, Malaysia, to Beijing, China. On 8 March 2014, the Malaysia Airlines Boeing 777-200ER operating the flight disappeared with 227 passengers of 15 nationalities and 12 crew members on board, following its last contact with air traffic control less than an hour after take-off. A joint search-and-rescue effort covering an area of 27,000 sq nmi (93,000 km2; 36,000 sq mi) in the Strait of Malacca and the South China Sea is being conducted by more than 12 countries. Vietnam briefly reduced its efforts on 11 March, but the search area continued to expand and searchers began to look for evidence on land. On 12 March, authorities also began to search the Andaman Sea, northwest of the Strait of Malacca. Two passengers who boarded the aircraft using stolen passports initially raised concerns of a terrorist plot. Malaysian police identified both passengers, and said they were unlikely to be terrorists. Communication between official representatives of many organisations and the public regarding the loss of the flight has been imprecise, incomplete, and sometimes inaccurateamidst continuing doubt about the aircraft’s possible location and trajectory. On 12 March The Wall Street Journal cited sources in the US government to claim that engine data automatically transmitted by the aircraft indicated that it remained airborne for a total of about five hours. US investigators were said to suspect the aircraft had been deliberately diverted “with the intention of using it later for another purpose.” However, on 13 March the Malaysian transport minister declared those reports inaccurate and stated that the last engine data transmission was received at 01:07. The flight departed from Kuala Lumpur International Airport on 8 March at 00:41 local time (16:41 UTC, 7 March) and was scheduled to land atBeijing Capital International Airport at 06:30 local time (22:30 UTC, 7 March). It ascended to its assigned cruise altitude of 35,000 feet (10,700 m) and was travelling at 471 knots (542 mph; 872 km/h) true airspeed when it ceased all communications and the transponder signal was lost. The aircraft’s last known position was 6°55′15″N 103°34′43″E, corresponding to the navigational waypoint IGARI, at which the aircraft was due to alter its course slightly eastward. The aircraft was also expected to contact air traffic control in Ho Chi Minh City as it passed into Vietnamese airspace just north of the point where contact was lost. The New Straits Times reported on 9 March that the captain of another aircraft had attempted to reach the pilots of MH370 “just after 1:30 am” to relay Vietnamese Air Traffic Control’s request for MH370 to contact it. The captain said he was able to establish contact but just heard “mumbling” and static. Malaysia Airlines issued a media statement at 07:24 confirming that contact had been lost at 02:40 and that search-and-rescue operations had begun. It later emerged that Subang Air Traffic Control had lost contact with the aircraft at 01:22 and notified Malaysia Airlines at 02:40.Neither the crew nor the aircraft’s onboard communication systems relayed a distress signal, indications of bad weather, or technical problems before vanishing from radar screens. The airline reported in its eleventh press release that all of its aircraft are fitted with an Aircraft Communications Addressing and Reporting System (ACARS), a system that automatically transmits data about the status of the aircraft, but added “Nevertheless, there were no distress calls and no information was relayed.” When Malaysian officials were asked by a Flightglobal reporter if they had any ACARS information or not, the officials declined to comment. The New Scientist nonetheless reported that prior to the aircraft’s disappearance, two ACARS reports had been automatically issued to engine manufacturer Rolls-Royce‘s monitoring center in the United Kingdom; and a Wall Street Journalstory, citing sources in the US government, said that Rolls-Royce had received an aircraft health report every thirty minutes for five hours, implying that the aircraft had remained in the air for four hours after its transponder went offline. The Journal also cited an official to state that US investigators were proceeding on the assumption that the aircraft had been diverted “with the intention of using it later for another purpose.” The Malaysian transport minister declared such reports inaccurate during the subsequent 13 March daily press briefing, stating that the final engine transmission was received at 01:07, prior to the flight’s disappearance from secondary radar. Route. Start: Kuala Lumpur, destination: Beijing. A:Andaman Sea, G: Gulf of Thailand. S: South China Sea. The search efforts generated multiple false leads. An admiral of the Vietnamese Navyreported that radar contact with the aircraft was last made over the Gulf of Thailand, but it transpired that this result corresponded to the loss of radar contact by Subang air traffic control rather than the discovery of a crash site. Oil slicks were located off the coast of Vietnam on 8 and 9 March and were thought to have possibly arisen from the aircraft. Test results reported on 10 March indicated that the oil slicks did not contain aviation fuel. There were reports that a door or other fragment of the aircraft was found about 80 km (50 mi) south of Thổ Chu Island on 9 March. The following day, the Department of Civil Aviation Malaysia reported these claims were untrue; the floating material was not from an aircraft. The Royal Thai Navy shifted its focus in the search away from the Gulf of Thailand and the South China Sea at the request of its Malaysian counterpart, which is investigating the possibility the aircraft turned around and could have gone down in theAndaman Sea, near Thailand’s border. The chief of the Royal Malaysian Air Force, Rodzali Daud, claimed that military recordings of radar signals did not exclude the possibility of the aircraft turning back on its flight path. The search radius has been increased from the original 20 nautical miles (37 km; 23 mi) of its last known position, south of Thổ Chu Island, to 100 nautical miles (190 km; 120 mi), and the area now covers the seas to the Strait of Malacca along the west coast of the Malay Peninsula, with waters both to the east of Malaysia in the South China Sea, and in the Strait of Malacca along Malaysia’s west coast, being searched. On 11 March, it was reported that military radar indicated the aircraft turned west and continued flying for 70 minutes before disappearing nearPulau Perak; and that it was tracked flying at a lower altitude across Malaysia to the Malacca Strait. This last location is approximately 500 km (311 mi) from its last position in contact with air traffic control. The next day Rodzali Daud denied making the statements as reported in the media, requesting that the misreporting be “amended and corrected to prevent further misinterpretations of what is clearly an inaccurate and incorrect report”. Vietnam scaled back its search operations to await clarification from Malaysia due to the conflicting reports. On 12 March, authorities also began to search the Andaman Sea, northwest of the Strait of Malacca, and the Malaysian government requested help from India to search in the area. China released satellite images captured three days earlier that show three floating objects measuring up to 24 by 22 metres (79 ft × 72 ft) at 6.7°N 105.63°E. It turned out there were no floating objects on the suspected crash area.The area, according to Vietnamese officials, had been “searched thoroughly” by Vietnam and other countries but it is to be revisited. The same day, a New Zealand man working on an oil rig in the South China Sea claimed he had seen the aircraft “burning at high altitude … in one piece” about 50 to 70 kilometres (31 to 43 mi) from his location around the time it disappeared. DigitalGlobe, a satellite imaging business, released to the public all available images of the flight path and search area for the public to look for and tag any images they believe may assist in the search. Australian RAAF AP-3C Orions are participating in the search. Chinese transport dock Kunlun Shan. Malaysia: CASA/IPTN CN-235, Beechcraft B200T King Air, Lockheed C-130 Hercules andBombardier Global Express fixed-wing aircraft; AgustaWestland AW109 and Eurocopter EC725helicopters. Vessels from the navy and Malaysian Maritime Enforcement Agency.Co-ordination centre at the National Disaster Control Centre (NDCC) in Pulau Meranti, Cyberjaya. Australia: air force Lockheed AP-3C Orion maritime patrol aircraft. Brunei: Darussalam-class offshore patrol vessel. China: Type 071 amphibious transport docks Kunlun Shan and Jinggang Shan, with helicopters, medical personnel, divers, and marines, life-saving and underwater detection equipment; Type 052C destroyer and helicopter; Type 053H3 frigate and Qiandaohu-class replenishment ship; three Chinese Maritime Safety Administration ships with helicopter and underwater scanning equipment; large search and rescue vessels; coast guard patrol vessel; and COSCO merchant ship. China has also retasked ten orbiting defence satellites over the area. India: Air and sea assets of the Andaman and Nicobar Command. Navy ships INS Saryu and INS Kumbhir; coast guard ship ICGSKanaklata Baruah; air force Dornier Do 228 fixed-wing and Mil Mi-17 rotary-wing aircraft; and navy Boeing P-8I and Tupolev Tu-142 maritime surveillance aircraft. Rukmini naval satellite. Indonesia: corvette and rapid patrol vessels; PC-40 fast patrol vessels; IPTN NC-212 maritime patrol aircraft. Japan: a disaster relief team, comprising eight Ministry of Foreign Affairs, Ministry of Defense, coast guard and International Cooperation Agency officials. New Zealand: air force Lockheed P-3K2 Orion. Philippines: BRP Gregorio del Pilar, BRP Emilio Jacinto, BRP Apolinario Mabini; an air force Fokker F27 and a navy Britten-Norman Defender aircraft; and a navy AgustaWestland AW109 helicopter. A Hamilton-class cutter vessel and a C-130 Hercules placed on standby. Singapore: air force C-130 Hercules; navy Formidable-class frigate with Sikorsky S-70B Seahawk helicopter; and a submarine rescue ship with divers; Victory-class corvette. Taiwan: air force C-130 Hercules, the frigate ROCS Tian Dan, and coast guard vessels. Thailand: Westland Super Lynx helicopter and a patrol ship. Two other ships on standby. United States: P-3C Orion aircraft; USS Pinckney with Sikorsky MH-60R Seahawk helicopters; logistical vessel USNS John Ericsson; a National Transportation Safety Board (NTSB) team. Vietnam: Antonov An-26, CASA C-212 Aviocar, de Havilland Canada DHC-6 Twin Otter, Mil Mi-171, and ships from the navy, coast guard, fisheries control, and Maritime Search & Rescue Coordination Centre. Flight 370 was operated by a Boeing 777-2H6ER,[a] serial number 28420, registration 9M-MRO. The 404th Boeing 777 produced, it first flew on 14 May 2002, and was delivered new to Malaysia Airlines on 31 May 2002. The aircraft was powered by two Rolls-Royce Trent 892 engines, and was configured to carry 282 passengers: 35 in business class and 247 in economy class. According to the airline, it had accumulated 53,460 hours and 7,525 cycles in service. 9M-MRO had not previously been involved in any major incidents; a minor incident while taxiing at Shanghai Pudong International Airport in August 2012 resulted in significant damage to one of its wingtips, which broke off after striking the tail of another airliner. Its last maintenance ‘A’ check was carried out on 23 February 2014. The Boeing 777 is generally regarded by aviation experts as having an “almost flawless” safety record, one of the best of any commercial aircraft. Since its first commercial flight in June 1995, there have only been two previous serious accidents. In January 2008, 47 passengers were injured when ice crystals in the fuel system of British Airways Flight 38 caused it to lose power and crash-land just short of the runway at London Heathrow Airport. In July 2013, three passengers died and 181 were injured whenAsiana Airlines Flight 214 crash-landed on final approach to San Francisco International Airport. Both aircraft were damaged beyond repair. In 2005 a Boeing 777-2H6ER aircraft with the registration 9M-MRG, serial number 28414, operating as Malaysia Airlines Flight 124 flying fromPerth to Kuala Lumpur experienced an ADIRU (air data inertial reference unit) fault resulting in uncommanded manoeuvres by the aircraft acting on false indications. In that incident the incorrect data impacted all planes of movement while the aircraft was climbing through 38,000 feet (11,600 m). The aircraft pitched up and climbed to around 41,000 feet (12,500 m), with the stall warning activated. The pilots recovered the aircraft with the autopilot disengaged and requested a return to Perth. During the return to Perth, both the left and right autopilots were briefly activated by the crew, but in both instances the aircraft pitched down and banked to the right. The aircraft was flown manually for the remainder of the flight and landed safely in Perth. There were no injuries and no damage to the aircraft. The ATSB (Australian Transport Safety Bureau) found that the main probable cause of this incident was a latent software error which allowed the ADIRU to use data from a failedaccelerometer. The US Federal Aviation Administration issued Emergency Airworthiness Directive (AD) 2005-18-51 requiring all 777 operators to install upgraded software to resolve the error. Malaysia Airlines released the names and nationalities of the 227 passengers and 12 crew, based on the flight manifest. All the crew members were Malaysian. The flight’s captain was 53-year-old Zaharie Ahmad Shah of Penang; he joined Malaysia Airlines in 1981 and had 18,365 hours of flying experience. Zaharie was also an examiner qualified to conduct simulator tests for pilots. His first officer was 27-year-old Fariq Abdul Hamid, an employee of Malaysia Airlines since 2007, with 2,763 flying hours. Fariq was transitioning to the Boeing 777-200 after completing his simulator training. The majority of the passengers (152 of 227) were Chinese citizens, which included a group of 19 artists with 6 family members and 4 staff, returning from a calligraphy exhibition of their work in Kuala Lumpur; 38 passengers were Malaysian. The remaining passengers came from 13 different countries. Of these, 20 were employees of Freescale Semiconductor, a company based in Austin, Texas – 12 were from Malaysia and 8 from China. Malaysia Airlines sent a team of caregivers and volunteers to provide assistance towards family members of the passengers. In its press releases, the carrier stated that it would bear the expenses of bringing family members of the passengers to Kuala Lumpur and providing them with accommodation, medical care, and counselling. Altogether, 115 family members of the Chinese passengers flew to Kuala Lumpur. Other family members chose to remain in China, fearing they would feel too isolated in Malaysia. The airline offered an ex gratia condolence payment of US$5,000 to the family of each passenger, but relatives considered the conditions unacceptable and asked the airline to review them. Boeing has announced that it is assembling a team of experts to provide technical assistance to investigators, in accordance withInternational Civil Aviation Organization (ICAO) protocols. In addition, the United States National Transportation Safety Board announced in an 8 March press release that a team of investigators had been sent along with technical advisers from the Federal Aviation Administration to offer assistance in the investigation. The country that will lead the investigation will not be determined until the missing aircraft is found.Because a formal (ICAO-sanctioned) investigation has not yet kicked off, co-operation and co-ordination between involved parties could suffer, there being “a risk that crucial early detective work could be hampered, and potential clues and records lost”, according to experts. The United States Federal Bureau of Investigation has deployed technical experts and agents to investigate the disappearance. A senior US law enforcement official clarified that FBI agents were not sent to Malaysia. United States and Malaysian officials are reviewing the entire passenger manifest in addition to the two passengers who were confirmed as possessing stolen passports. Two of the passengers were travelling with passports stolen from citizens of European countries. Two men identified on the manifest, a 30-year-old Austrian and a 37-year-old Italian, had reported their passports stolen in 2012 and 2013, respectively. Interpol stated that both passports were listed on its database of lost and stolen passports, but that no check had been made against its database, noting that very few countries consistently use the database. Malaysia’s Home Minister, Ahmad Zahid Hamidi, criticised his country’s immigration officials for failing to stop the passengers travelling on the stolen European passports. The two one-way tickets purchased for the holders of the stolen passports were booked through China Southern Airlines. It was reported that an Iranian had ordered the cheapest tickets to Europe via telephone. The tickets were paid for in cash. A Thai police chief suggested that the tickets were bought for illegal Iranian migrants. The two passengers were later identified as Iranian men, one aged 19 and the other 29, who both entered Malaysia on 28 February using valid Iranian passports. The head of Interpol said they were “inclined to conclude that it was not a terrorist incident”. The two men were believed to be asylum seekers. Communication between official representatives of many organisations and the public regarding the loss of the flight has been beset with confusion. The New York Times noted that the Malaysian government and the airline released imprecise, incomplete, and sometimes inaccurate information, with civilian officials sometimes contradicting military leaders. The Daily Beast suggested that nobody was co-ordinating information. David Learmount, operations and safety editor at Flightglobal, a news and data service for the aviation sector, said the Malaysian government seemed evasive and confused. There are doubts concerning the aircraft’s possible location and trajectory. Australian crisis management expert Mike Smith believes that although the initial stages had been well-managed by Malaysia Airlines, the increasing numbers of government officials commenting publicly created confusion. Smith suggested that, as the disappearance became of international concern, the Malaysian government failed to take control and to establish an emergency crisis control point where the information could be disseminated in a responsible and truthful manner. Smith pointed to contradictions, apparent “finger-pointing, rumours and innuendo … from Malaysian officials, whose motives we can only speculate about”. Malaysia Airlines stated it would retire the flight numbers MH370 and MH371 as of 14 March 2014, replaced by MH318 and MH319 respectively. Jump up^ The aircraft was a Boeing 777-200ER (for Extended Range) model; Boeing assigns a unique customer code for each company that buys one of its aircraft, which is applied as a suffix to the model number at the time the aircraft is built. The code for Malaysia Airlines is “H6”, hence “777-2H6ER”. Jump up^ The manifest released by Malaysia Airlines lists an Austrian and an Italian. These have since been identified as two Iranian nationals who boarded Flight 370 using stolen passports. Jump up^ “BBC News – Malaysia Airlines MH370: Last communication revealed”. Bbc.com. 1970-01-01. Retrieved 2014-03-13. ^ Jump up to:a b c Hildebrandt, Amber (10 March 2014). Malaysia Airlines Flight MH370: ‘Mystery compounded by mystery’. CBC News. ^ Jump up to:a b Buncombe, Andrew; Withnall, Adam (10 March 2014).“Malaysia Airlines Flight MH370: Oil slicks in South China Sea ‘not from missing jet’, officials say”. The Independent. Jump up^ Grudgings, Stuart. “Malaysia Airlines plane crashes in South China Sea with 239 people aboard: report”. Retrieved 8 March 2014. Jump up^ Tasnim Lokman (9 March 2014). “MISSING MH370: Indonesia helps in search for airliner”. New Straits Times. Retrieved 9 March 2014. Jump up^ Grudgings, Stewart. “Confusion as search for Malaysian jet spreads across SE Asia”. Reuters. Retrieved 12 March 2014. ^ Jump up to:a b Tania Branigan; Kate Hodal (10 March 2014). “Flight MH370: officials ‘puzzled’ by Malaysia mystery as search widens”. The Guardian. Retrieved 10 March 2014. Jump up^ “Malaysia Airlines MH370: Stolen passport ‘no terror link'”. BBC News. Retrieved 11 March 2014. ^ Jump up to:a b c Fuller, Thomas (11 March 2014). “Confusion Over Plane’s Route Frustrates Families and Search”. The New York Times. Retrieved 12 March 2014. ^ Jump up to:a b “Malaysia Airlines live: Chinese authorities publish images of possible wreckage”. The Daily Telegraph. 15 October 2013. ^ Jump up to:a b Koswanage, Niluksi. “UPDATE 1-Missing Malaysian plane last seen at Strait of Malacca-source”. Reuters. Retrieved 12 March 2014. ^ Jump up to:a b Andy Pasztor (12 March 2014), Missing Airplane Flew On for Hours The Wall Street Journal. ^ Jump up to:a b “Malaysia says no evidence missing plane flew hours after losing contact”. Reuters. 13 March 2014. Retrieved 13 March 2014. Jump up^ “FlightRadar24.com MH370 7 March 2014”. Jump up^ “Malaysian Airlines System (MH) No. 370 ✈ 08-Mar-2014 ✈ WMKK / KUL – ZBAA / PEK ✈”. flightaware. Retrieved 8 March 2014. Jump up^ Pilot: I established contact with plane New Straits Times 9 March 2014. Jump up^ Malaysian Airlines. “04:20 PM MYT +0800 Malaysia Airlines MH370 Flight Incident – 4th Media Statement”. Malaysian Airlines. Archived from the original on 8 March 2014. Retrieved 8 March 2014. ^ Jump up to:a b c “Crash: Malaysia B772 over Gulf of Thailand on Mar 8th 2014, aircraft missing”. The Aviation Herald. Retrieved 8 March 2014. Jump up^ “Missing MAS flight: Last point of contact was east of Kota Baru”. The Star. 8 March 2014. Retrieved 8 March 2014. Jump up^ “No MH370 Distress Call, Search Area Widened”. Aviation Week & Space Technology. 12 March 2014. Jump up^ Greg Waldron (11 March 2014), Malaysian officials non-committal on MH370 ACARS transmissions Flightglobal. Jump up^ “Missing Malaysia Airlines Plane Remains Mystery”. Sky News. 10 March 2014. Retrieved 10 March 2014. Jump up^ “Oil slick spotted by rescuers ‘not from missing Malaysia Airlines flight’, tests reveal”. South China Morning Post. Retrieved 10 March 2014. Jump up^ “Accident description”. Aviation Safety Network. 10 March 2014. Retrieved 10 March 2014. Jump up^ Jim Clancy and Mark Morgenstein (9 March 2014). “New leads explored in hunt for missing Malaysia Airlines flight”. CNN News. Retrieved 10 March 2014. Jump up^ Pete Williams, Robert Windrem and Richard Esposito (9 March 2014). “Missing Malaysia Airlines Jet May Have Turned Back: Officials”. NBC News. Retrieved 9 March 2014. Jump up^ “Reports: Missing Malaysia Airlines plane ‘may have turned back'”. BBC News. 9 March 2014. Retrieved 9 March 2014. Jump up^ “DCA: Search for MH370 intensifies with 74 vessels, 50 nautical miles near last-known site” The Malay Mail, 9 March 2014. Jump up^ “Malaysia Airlines: What we know about flight MH370”. BBC. 10 March 2014. Retrieved 10 March 2014. ^ Jump up to:a b “Missing Malaysia plane: Search area widened”. BBC News. 9 March 2014. Jump up^ “Malaysia Airlines MH370: Plane ‘changed course'”. BBC. 11 March 2014. Retrieved 11 March 2014. Jump up^ “Malaysia Airlines live: military denies report they tracked plane hundreds of miles off course”. The Telegraph. 11 March 2014. Jump up^ Danubrata, Eveline; Koswanage, Niluksi (11 March 2014).“Malaysia military tracked missing plane to west coast: source”. Reuters. Retrieved 11 March 2014. Jump up^ “MISSING MH370: RMAF chief denies military radar report”. New Straits Times. 12 March 2014. Retrieved 12 March 2014. Jump up^ “Missing Malaysia Airlines plane: Air force chief denies tracking jet to Strait of Malacca”. The Straits Times. 12 March 2014. Retrieved 12 March 2014. Jump up^ “Missing Malaysia Airlines plane: Vietnam suspends air search for MH370”. The Straits Times. 12 March 2014. Retrieved 12 March 2014. Jump up^ “Malaysia Airlines MH370: Confusion over plane last location”. BBC News. 12 March 2014. Jump up^ “Satellite looking into missing Malaysia flight detects ‘suspected crash area'”. CNN News. Retrieved 13 March 2014. Jump up^ “China Releases Images of What Could be Parts of Missing Plane”. Malaysia Sun. Retrieved 13 March 2014. Jump up^ “Malaysia Airlines Flight 370: Vietnam sees no debris in area flagged by Chinese”. CNN News. Retrieved 13 March 2014. Jump up^ “Malaysia Airlines MH370: China ‘will not give up’ on plane”. BBC News. Retrieved 13 March 2014. Jump up^ Brummitt, Chris. “Breaking News | PE.com – Press-Enterprise”.Associated Press. Jump up^ Post Store (28 February 2011). “U.S. suspects missing flight flew for hours after last confirmed location, report says”. The Washington Post. Jump up^ Abby Ohlheiser. “Oil Rig Worker Thinks He Saw Malaysia Air Flight 370 Go Down in Flames”. Business Insider. Retrieved 12 March 2014. Jump up^ Martinez and Newsome. “Crowdsourcing volunteers comb satellite photos for Malaysia Airlines jet”. CNN. Retrieved 12 March 2014. Jump up^ Sandell, Clayton. “Crowdsourcing the Search for Malaysia Flight 370”. ABC News. Retrieved 12 March 2014. Jump up^ “MISSING MH370: Malaysia welcomes SAR assistance from other countries”. New Straits Times. 9 March 2014. Retrieved 10 March 2014. Jump up^ Wong, Chun-Han; Vu, Trong Khanh; Raghuvanshi, Gaurav (9 March 2014). “Countries Put Disputes Aside for Airliner Search”.The Wall Street Journal. Jump up^ “French accident board offers help recovering missing flight MH370”. The Malaysian Insider. Yahoo! News. 10 March 2014. Retrieved 10 March 2014. Jump up^ “Missing MH370: Qatar ready to help in SAR efforts”. The Sun. 11 March 2014. Retrieved 11 March 2014. Jump up^ “IDC infrasound search for missing flight Malaysian Airlines MH370”. CTBTO Prep Com. Retrieved 12 March 2014. ^ Jump up to:a b “Too early to come to any conclusion, says Najib”. Daily Express. 9 March 2014. Retrieved 9 March 2014. Jump up^ “Vietnam, Malaysia mount search for plane”. Sky News Australia. 8 March 2014. Jump up^ “Malaysia widens area of search for missing MAS aircraft”.Borneo Post. Bernama. 9 March 2014. Retrieved 9 March 2014. Jump up^ “Missing MAS flight: Malaysia grateful for assistance in search and rescue operations, says Anifah”. The Star. 9 March 2014. Retrieved 9 March 2014. Jump up^ “Australia sending two P3C Orions from Darwin to Malaysia to aid with the search for missing Malaysian flight MH370”. News Corp Australia. 9 March 2014. Retrieved 9 March 2014. Jump up^ “Brunei’s Suldan sends message of sympathy to Chinese president over loss of flight MH370”. Xinhua News Agency. 10 March 2014. Retrieved 12 March 2014. Jump up^ “China dispatches more vessels for plane search”. Xinhua News Agency. 9 March 2014. Retrieved 10 March 2014. Jump up^ “Chinese warships on way to rescue mission”. Xinhua News Agency. 9 March 2014. Retrieved 9 March 2014. Jump up^ “China deploys satellites for missing plane search”. Xinhua News Agency. 10 March 2014. Retrieved 10 March 2014. ^ Jump up to:a b Gupta, Jayanta. “Indian Navy joins search”. The Times of India. Retrieved 11 March 2014. Jump up^ Bagus BT Saragih (9 March 2014). “RI deploy warships as search expands to Malacca Strait”. The Jakarta Post. Retrieved 10 March 2014. Jump up^ Fadli (9 March 2014). “RI deploys warships, aircraft to SCS to search for missing aircraft”. The Jakarta Post. Retrieved 9 March 2014. Jump up^ “MH370 SAR ops: Tokyo dispatches Japan Disaster Relief team”. The Malay Mail. 12 March 2014. Retrieved 12 March 2014. Jump up^ Michael Field (11 March 2014). “NZ air force joins search for missing jet”. stuff.co.nz. Retrieved 11 March 2014. Jump up^ “Malaysian plane crashed off Vietnam coast: state media”.Yahoo News. 8 March 2014. Retrieved 8 March 2014. Jump up^ “PH joins SE Asia search for Malaysian plane”. Rappler. 8 March 2014. Retrieved 8 March 2014. Jump up^ “Malaysia Airlines: How is the search being carried out”. BBC News. 11 March 2014. Retrieved 11 March 2014. Jump up^ “PH planes ships still have no sighting of missing malaysian jet”. Philippine Daily Inquirer. 9 March 2014. Retrieved 9 March 2014. Jump up^ “Phl Navy’s helicopter joins search for missing Malaysian Airlines plane”. The Philippine Star. 13 March 2014. Retrieved 13 March 2014. Jump up^ “Malaysia Airlines missing flight: Live Report”. Yahoo! News Malaysia. 8 March 2014. Retrieved 8 March 2014. Jump up^ “Malaysian Airlines missing flight MH370: Live Report”. Digital Journal. 8 March 2014. Retrieved 8 March 2014. Jump up^ “Additional SAF assets deployed in response to missing Malaysia Airlines Plane (09 Mar 14)”. Ministry of Defence of Singapore. 9 March 2014. Retrieved 9 March 2014. Jump up^ “Taiwan joins search for Malaysia Airlines Flight 370”. Taiwan Today. 11 March 2014. Archived from the original on 12 March 2014. Retrieved 12 March 2014. Jump up^ “Search for missing Malaysian jet involves 8 countries”. The Nation. 10 March 2014. Retrieved 10 March 2014. Jump up^ “Thai navy ready to deploy rescue vessels, aircraft for missing Malaysian plane: spokesman”. CCTV News. 8 March 2014. Retrieved 9 March 2014. Jump up^ “MISSING MH370: Rescue efforts under way”. New Straits Times. 9 March 2014. Retrieved 9 March 2014. ^ Jump up to:a b “US P-3 and USS Pinckney helicopter over Malaysian Airlines search site”. U.S. Seventh Fleet Public Affairs. 9 March 2014. Retrieved 9 March 2014. Jump up^ “U.S. Sends Destroyer to Aid Search for Malaysia Airlines Jet”.NBC News. 8 March 2014. Retrieved 8 March 2014. Jump up^ “Oil Slick Not From Missing Malaysian Jet, Investigators Say”. NBC News. 22 November 2013. Retrieved 10 March 2014. Jump up^ “US bolsters support for search of lost plane”. Malaysia Sun. Retrieved 10 March 2014. ^ Jump up to:a b “Press Release March 8, 2014: NTSB positioning team to offer assistance in investigation of Malaysia Airlines 777 event”. Ntsb.gov. Retrieved 9 March 2014. Jump up^ “RSAF sends plane to search for missing Malaysia Airlines aircraft”. Channel NewsAsia. 8 March 2014. Jump up^ “No piece of metal found 60km from Vung Tau”. Bubblews. Jump up^ Pither, Tony (1998). The Boeing 707 720 and C-135. England: Air-Britain (Historians) Ltd. ISBN 0 85130 236 X. Jump up^ “Malaysia Airlines 9M-MRO (Boeing 777 – MSN 28420)”.Airfleets. Retrieved 7 March 2014. Jump up^ “Boeing 777-200 – Fleet”. Malaysia Airlines. Retrieved 12 March 2014. ^ Jump up to:a b Toh, Mavis. “MAS 777 underwent maintenance in Feb”. Flightglobal. Retrieved 9 March 2014. Jump up^ “Missing MAS 777-200 had no major prior incidents – 3/8/2014”. Flightglobal. Retrieved 9 March 2014. Jump up^ “浦东机场滑行跑道内东航马航两飞机剐蹭 [“Two planes from China Eastern Airlines and Malaysian Airlines snag each other on the runway of Shanghai Pudong Airport”]– 新华财经 – 新华网”. Xinhua News Agency. 26 June 2012. Retrieved 9 March 2014. Jump up^ “Malaysia Airlines: experts surprised at disappearance of ‘very safe’ Boeing 777”. The Guardian. 8 March 2014. Retrieved 9 March 2014. Jump up^ “Malaysia Airlines has one of Asia’s best safety records”.Reuters. 8 March 2014. Retrieved 9 March 2014. Jump up^ 06.31 GMT. “Malaysia Airlines: experts surprised at disappearance of ‘very safe’ Boeing 777”. The Guardian. Retrieved 10 March 2014. Jump up^ “NTSB Investigates Asiana 777 Accident in San Francisco”.Aviation Week & Space Technology. 6 July 2013. Retrieved 10 March 2014. 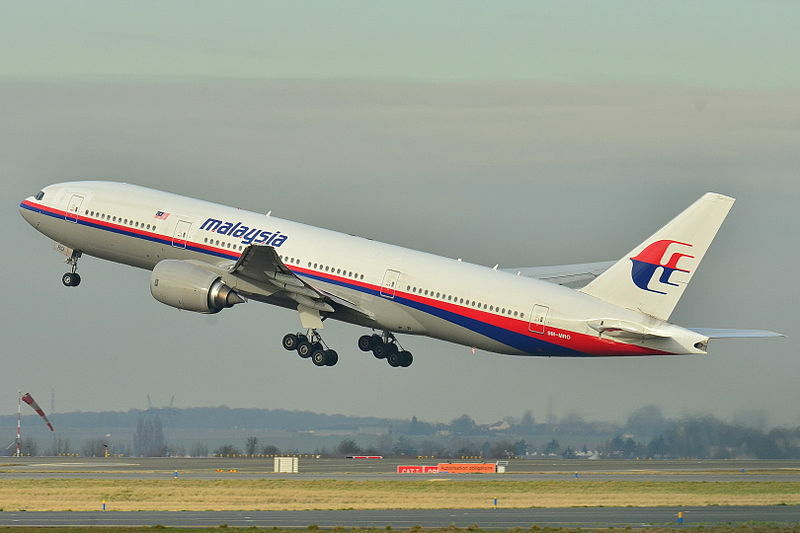 Jump up^ Accident description for Malaysia Airlines Flight 124 at theAviation Safety Network. Retrieved on 15 October 2008. Jump up^ “In-flight upset event, 240 km north-west of Perth, WA, Boeing Company 777-200, 9M-MRG, 1 August 2005” (PDF). Australian Transport Safety Bureau. 13 March 2007. Retrieved 15 October 2008. Jump up^ “Emergency Airworthiness Directive (AD) 2005-18-51”. Federal Aviation Administration. 29 August 2005. Retrieved 15 October 2008. Jump up^ Kao, Ernest (9 March 2014). “Hong Kong woman named as passenger on board missing Malaysia Airlines flight”. South China Morning Post. Retrieved 10 March 2014. ^ Jump up to:a b “Stolen jet passport ‘no terror link'”. BBC News. 11 March 2014. Retrieved 11 March 2014. Jump up^ “MH370 Passenger Manifest” (Press release). Malaysia Airlines. 8 March 2014. Archived from the original on 8 March 2014. Jump up^ “Missing MAS flight: Captain piloting MH370 a Penang boy”. The Straits Times. 8 March 2014. Retrieved 9 March 2014. Jump up^ Koswanage, Niluksi (9 March 2014). “Pilot of missing Malaysian flight an aviation tech geek”. Reuters. Retrieved 10 March 2014. Jump up^ “MISSING MH370: Co-pilot family awaits for latest updates – Latest”. New Straits Times. 8 March 2014. ^ Jump up to:a b Watkins, Tom (10 March 2014). “First officer on missing jet was transitioning to 777-200s”. CNN. Retrieved 10 March 2014. Jump up^ “Behind jet’s passenger list is rich human tapestry”. The Washington Post. Associated Press. 9 March 2014. Retrieved 10 March 2014. Jump up^ “No sign of Malaysia Airline wreckage; questions over stolen passports”. CNN. 8 March 2014. Retrieved 10 March 2014. Jump up^ “Missing MAS flight: MAS team arrives in Beijing”. The Star. 9 March 2014. Retrieved 9 March 2014. Jump up^ “Caregivers from Malaysia, Australia assigned to families of passengers onboard MH370”. The Malay Mail. Jump up^ “Missing Malaysia jet may have veered off course”. CNBC. Retrieved 12 March 2014. Jump up^ “MISSING MH370: Families cling to faint hopes: psychologist”.New Straits Times. 10 March 2014. Retrieved 12 March 2014. Jump up^ Rose, Adam (12 March 2014). “Malaysia Airlines says no reason to think crew caused jet’s disappearance”. Chicago Tribune. Retrieved 12 March 2014. Jump up^ “MAS cash aid snubbed by kin of Chinese aboard MH370”. The Malay Mail. 11 March 2014. Retrieved 12 March 2014. Jump up^ “Boeing team to offer technical help to investigators”. Deccan Chronicle. Jump up^ Toh, Mavis. “NTSB sends team to assist in MH370 case”. Flightglobal. Retrieved 9 March 2014. Jump up^ Siva Govindasamy, Alwyn Scott and Tim Hepher (12 March 2014).“Missing Malaysia Airlines plane’s legal limbo hampers probe”.The Sydney Morning Herald. Retrieved 12 March 2014. Jump up^ Serrano, Richard A. “FBI to investigate disappearance of a Malaysian Airlines jet.” Los Angeles Times. 8 March 2014. Retrieved 9 March 2014. Jump up^ “FBI not in on Malaysia crash probe; other U.S. agencies to arrive Monday”. Reuters. Retrieved 11 March 2014. Jump up^ Simon Denyer, Robert Barnes and Chico Harlan (9 March 2014).“Four flew with false ID aboard Malaysia Airlines plane that vanished over South China Sea”. The Washington Post. Retrieved 9 March 2014. Jump up^ Catherine E. Shoichet and Ray Sanchez (9 March 2014 – Updated 1337 GMT (2137 HKT)). “Plane bore painters, pilgrims, others from around the world”. CNN. Retrieved 8 March 2014. Jump up^ “INTERPOL confirms at least two stolen passports used by passengers on missing Malaysian Airlines flight 370 were registered in its databases”. Interpol. Retrieved 9 March 2010. ^ Jump up to:a b Murdoch, Lindsay (10 March 2014). “Fake passports on Malaysia Airlines flight reveal flaw in airline safety”. The Sydney Morning Herald. Retrieved 10 March 2014. Jump up^ Keith Bradsher; Eric Schmitt (9 March 2014). “Passport Theft Adds to Mystery of Missing Malaysia Airlines Jet”. The New York Times. Jump up^ Mezzofiore, Gianluca (10 March 2014). “Missing Malaysia Airlines Flight MH370: Iranian Middleman Asked Thai Agent to Book Tickets on Stolen Passports”. International Business Times (UK). Retrieved 11 March 2014. Jump up^ “Days later, no sign of missing Malaysia Airlines plane”. CNN. Retrieved 10 March 2014. Jump up^ Associated, The. “Iranian man bought tickets for Malaysia Air passengers using stolen passports”. Haaretz. Retrieved 10 March 2014. Jump up^ Mullen, Jethro (11 March 2014). “Missing Malaysia Airlines Flight 370: What we know and don’t know”. CNN. Retrieved 11 March 2014. Jump up^ Mullen, Jethro (11 March 2014). “Interpol ‘inclined to conclude’ Malaysia Airlines disappearance not terror”. CNN. Retrieved 11 March 2014. Jump up^ “MISSING MH370: Man with stolen passport on jet is asylum seeker – Latest”. New Straits Times. Jump up^ Saeed Kamali Dehghan. “Iranians travelling on flight MH370 on forged passports ‘not linked to terror’ | World”. The Guardian. ^ Jump up to:a b Irving, Clive (11 March 2014). “The Botched Hunt for Malaysian Airlines Flight 370”. The Daily Beast. Jump up^ Ng, Eileen. “Malaysia says not sure which way jet was headed”.San Francisco Chronicle. Associated Press. Retrieved 12 March 2014. Jump up^ Levy, Megan (12 March 2014). “Missing Malaysia Airlines plane probe marked by confusion, misinformation”. The Sydney Morning Herald. Retrieved 12 March 2014. Jump up^ Anwar, Zafira; Nambiar, Predeep “MISSING MH370: MAS changes flight number for KL-Beijing-KL flights”. New Straits Times. Next Logic before silly fatwa?